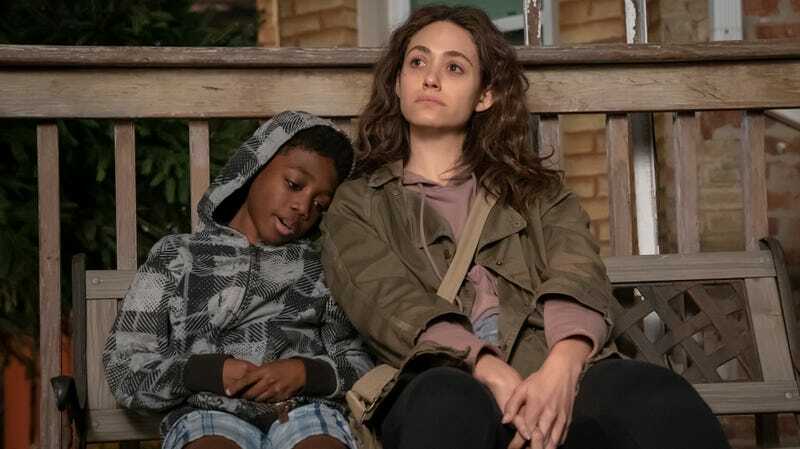 Unlike last week’s return, this week’s Shameless has an actual theme, trying to piece together its disparate storylines into something borderline cohesive. That theme is “the future,” with Frank and Ingrid planning for their six kids, Lip and Tami confronting the possibility of their relationship becoming more serious, and Carl and Kelly vision boarding their future. Now, you’ll notice something important about this theme: it doesn’t actually apply to about half of the show’s characters. Fiona’s story is still stuck in the past, as she fumes over her breakup with Ford and steals his tools with zero consequence, even after throwing them through his windows. Debbie has fully taken over the Gallagher household, even going so far as to change the locks on her 10-year-old brother until he pays her for his electricity use, but how this ties into her future on any level is deeply unclear. And if there’s any kind of future in Kev and Vee randomly driving to Indiana and haplessly searching for and then tipping off the police to Santiago’s undocumented uncle, the show certainly hasn’t bothered to suggest it. More than anything, “BOOOOOOOOOOOONE!”—that’s twelve Os, I made sure to get it right—reinforces that a show this disinterested in laying the groundwork for the future shouldn’t really be telling stories about, you know, the future. We know that Ingrid will not be giving birth to six babies. And while it’s possible that Tami and Kelly will be a huge part of the show moving forward, it feels like we’ve known them for approximately fifteen seconds, and the show hasn’t done the requisite work necessary for us to be invested in the future of these relationships. And meanwhile, the character whose future I’m most invested in—Fiona, if you haven’t been reading these reviews—is stuck in a rut that doesn’t really make a whole lot of sense, her lack of future seemingly increasingly alarming when you consider the show has five episodes to send her off into the sunset. If someone can explain to me why Fiona’s breakup with Ford has her so bent out of shape, I’m really open to hearing about it. Emmy Rossum plays Fiona’s righteous anger as well as ever, but what was it about this relationship? I understand Fiona being angry about her investments, but was she that attached to Ford? What was it about their relationship that was so important to her? Why is it this relationship that is breaking her to an all-new level? If the show wants to argue that her rage is an accumulation of all the other assholes who’ve hurt her, that’s fine, but the show isn’t making that argument. Similar to when all of Lip’s problems suddenly stemmed from his ill-advised affair with his professor, Fiona’s issues are being dropped onto Ford’s doorstep, despite the fact that he’s about as interesting as a doorstop. At one point, Lip says that Fiona is “going through some things,” but those things feel incredibly thin, especially when the show was content to ignore the investment woes entirely in favor of focusing on Ford here. Even in the stories where the show was most explicit about looking toward the future, the disinterest in the show’s past is creating some bizarre storytelling choices. In both Tami and Lip’s conflict over her weird war hero “promised husband” and Carl and Kelly’s negotiation of her father’s disapproval, the Gallagher children involved in these stories have no actual character arcs to speak of. In the former case, Tami is the one dealing with her mother’s death, and the way her mortality has pushed her toward a way of living life that fails to account for her feelings. When she and Lip decide to become exclusive—by acknowledging they’re both hurt that the other slept with someone else—that’s a big moment for Tami, but is it a big moment for Lip? It’s a great question, but one the episode entirely ignores, refusing to think about any of Lip’s past relationships to consider whether this is meaningful for him in any way. The idea that this development is more important to the character introduced earlier this season and just recently reintroduced as a serious part of his life than it is for the character we’ve known for nine seasons is an absurd reality, but one the show doubles down on with Carl. As Ingrid gives the couple some free therapy via vision boards, Carl’s vision is clear: he’s going to use the military as a way of overcoming the disadvantages Kelly has helped him realize he’s faced in his life. Kelly, meanwhile, has a transformative moment making the vision boards, realizing she doesn’t know what she really wants outside of her father’s wishes, leading her to a fiery ultimatum that allows her and Carl to stay together while still working toward Annapolis in a way that she actually wants. It’s a really well-acted moment from Jess Gabor, but why in the hell am I talking about big emotional moments for barely developed love interests instead of for the Gallagher children? How has Carl’s past become a footnote so easily? What does this relationship mean to him? The show has been so casual about Carl’s military future that it has basically started an entirely new character arc for him, to the point of killing off his girlfriend and never acknowledging it (I’m still not over this). I’ve come to terms with the fact that Shameless’ idea of political storytelling is making its characters spectators to thinly drawn anecdotes: there’s no substance to the show’s commentary on family separation and asylum speakers, and they certainly didn’t earn that “I.C.E. Children’s Choir” stinger, but I understand the impulse to use the show’s adjacency to issues of class and race to say something about the messed up world we live in. However, how the show has become so disinterested in using that same adjacency to say something about the Gallaghers themselves is beyond comprehension. This is a better episode than last week’s return, with some semblance of structure, but it continues to reinforce that Shameless has become a television show incapable of articulating why we should be invested in its future. SPECIAL INVESTIGATION PART TWO: Okay, when is this episode of Shameless happening? This is a rollercoaster. The episode begins with a very clear timeframe, as Debbie insists that it has been three months since Fiona stopped paying the bills in the wake of her accident. This doesn’t make sense with her cast—as noted last week, 6-8 weeks is typical—but let’s put that aside for a moment. The episode then reveals that Ingrid’s pregnancy results are in, which the internet is telling me probably took at least two weeks, meaning it had been about two and a half months since her accident in last week’s episode, which…sure. Although that’s for when they would be able to confirm the pregnancy, but that wouldn’t actually be tied to the first ultrasound, according to the research I did, so who even knows? And if it has been three months, shouldn’t Carl and Liam be back to school right now? And more importantly, shouldn’t someone point out that Liam was just completely missing in last week’s episode and no one commented on it in any capacity?! And just to add to the fun, the way the episode is edited suggests that the alcohol company’s executives were just briefed on a business plan for a new drink and seconds later it’s showing up at the Alibi? Beyond the fact that it was frankly silly to cut to characters we don’t know to deliver pure exposition—there had to be a better way—the implication that the production and distribution of the product happened instantaneously with what appeared to be the executives first hearing about the concept is just unnecessarily silly. It says something that I legitimately thought they might have made a mistake on the fun run t-shirts before I got a better look at the “10k (just kidding it’s a 5k) joke.” It’s a good joke, although how exactly the Fun Run is raising any kind of funds seems missing. But seriously, Debbie locking out Liam for not covering his share of the bills as a 10-year-old is certifiably insane. Debbie’s whole deal makes no sense: Lip is right that Fiona has earned more respect than she’s giving, even if she’s in a age situation, but Debbie doesn’t care because…this is all her character has right now after they abandoned that whole lesbian storyline? Speaking of which, Liam’s “I’m leaving my options open” is how you make a nice gesture to the spectrum of sexuality. Debbie’s random lesbian relationship? Less nice. I know, I’m harping on the time thing, but how does Fiona still have a job if she’s been acting like this for three months? I’m not sure there’s been a more tired-sounding attempt at injecting politics into the show than Frank’s half-hearted “we have to drain the swamp” after the Welfare office refused to give him money for future children. Macy didn’t seem invested in it, and neither did the episode around him. I know that the people who want to build the Wall may not have the best understanding of its likely effectiveness, but can you explain to me why anyone would spend $1 to symbolically wall in a Latino child tied to a fence? What did they think it would accomplish? I have so many questions. I know I’ve spent years complaining whenever the show paired Fiona off instead of letting her operate independent of boyfriends, but the boxing coach seemed nice enough, and at least a broken nose meet cute would be something for the show to work forward with.